For us to become the best at what we do and deliver quality service, we must first and foremost take care of ourselves. I’ve heard a lot of my fellow lash artists sharing their concerns about physical and emotional health. We know that working with a client takes time and because of that, we are subjecting our bodies to stress that could potentially be life-threatening if not properly prevented. As lash professionals, our hands are really essential to our job. But we all know that it is also the first one to feel pain and strains. Because of the repeated gestures that we do when lashing, we are prone to hand and wrist pain, cramps and carpal tunnel syndrome. Wow, technical terms really do give shivers. So, it is without a doubt, highly important that we do precautionary measures to prevent these from happening to us. I recommend using high-quality products and tools. Make use of tools that will definitely aid you when doing the job. Forceps that you do not need to exert much force is a great example. This is also where proper lashing techniques plays a major part. 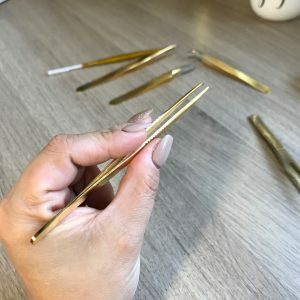 The proper form and hand motion when applying the lashes can make a great deal and minimize hand strains. Performing hand and wrist exercise are also useful. When you are waiting for your next client, you can do simple hand and wrist exercises; massage it thoroughly or use a stress ball. With this, it is crucial that you have an appointment with your eye doctor or optometrist, that is a trained professional who measures your eyesight. Even though you think you may be able to see well, there is always the chance that one of the eyes is not exactly the same strength as the other one. I actually went to an optometrist and I got my eyes tested. 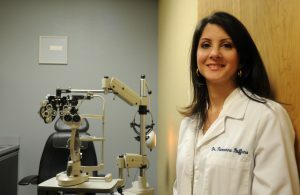 The doctor can monitor your eyesight and guide you if and when you need glasses whenever you are doing lashes. I tried out different glasses with varied magnifications and tested out how I do with each of them when pulling out lashes with tweezers. So, I had a pair of glasses fit for my specification. I highly recommend you see a professional. Another thing that you can do is to manipulate your surroundings. Make your lash space soothing to the eyes. Good lighting is so important. It will also make your lash application easier. Eye breaks are also key! Schedule these when you are doing services or between clients. Refresh your eyes when you are not handling a client. I read once that you can also massage your eyelids and areas above and below your brow line and temples to relieve eye strain. Stress is part of any type of job and since we are directly in contact with our clients, it is inevitable that we absorb their energy based on the conversations that we are having. It is best that we keep a positive conversation with our clients. Avoid gossiping or complaining about things. Yes, this can be difficult but if you put out a positive energy towards your clients, your conversation will also flow in that direction. You can research on common topics that could divert you to happy and positive topics. These are 3 common health concerns that I have personally experienced and I see happening to my fellow lash artists. If you happen to know of some more, comment below and share also helpful prevention tips. Let us help each other out. Ps. I have also written a blog before about how Eyelash Adhesives can make us sick. Check it out and find out how the fumes can be detrimental to our health.